HAPPY EASTER! - Please note that our office is closed from Fri 19 - Mon 22 Apr. All bookings & requests will be processed when we reopen on 23 Apr. Please note: A 1.9% fee applies to payments made by Credit Card. If you are only paying a deposit today, please note of the final payment due date by clicking here. *The fare displayed above is a from price, based on a tour departure in low season and is correct as at . Surcharges may apply to some departure cities & dates. Visit our website or call us for all of our current available departure dates & prices from your departure city. 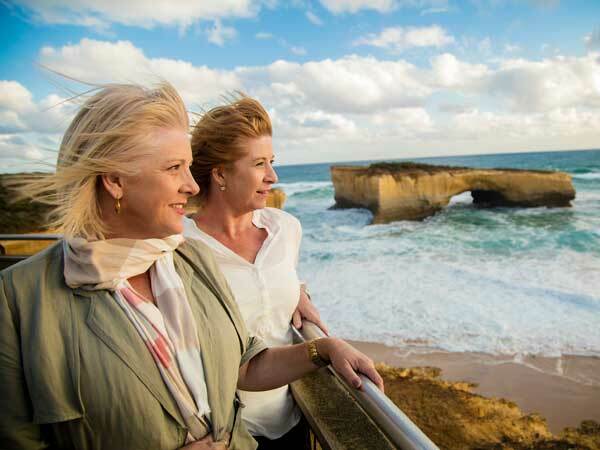 A fabulous 5 day getaway with the opportunity to discover and enjoy the magic of Victoria’s stunning Great Ocean Road. Please select from the options below to view the total price for your tour. If you choose to pay a deposit only today & the balance later, please note when the balance of your booking is due by clicking here. Adelaide travellers: Our journey to Skenes Creek on the Great Ocean Road begins today at 8:30am. We travel through the Adelaide Hills via Tailem Bend and Keith for a refreshment stop. We continue to Bordertown for our lunch stop. Later we continue via Eden Hope then Colerarne onto Hamilton for our overnight stay. Other travellers: Board a flight from your homeport to Melbourne and be transferred to Southern Cross Station to join a V/Line train service to Geelong. Then, board the V/Line coach for your journey to Skenes Creek. Your hostess will meet you on arrival at the Skenes Creek Lodge to check you in. Later, we enjoy dinner in the restaurant. Adelaide travellers: After breakfast today, we depart Hamilton and tour via Penshurst and Mortlake in Victoria’s rich Western district. On arrival at Skenes Creek Lodge, we check in for our holiday stay. All travellers: After lunch, we set off into the great Otway National Park, travelling along the Lighthouse Road which takes us to the historic Cape Otway Lighthouse itself. See the head lighthouse keepers house, the historic old Telegraph Station and the Whale Interpretative Centre. You may wish to take a short walk along one of the scenic self-guided walking tracks. Later, we drive along Skenes Creek Road, exploring more of the magnificent Cape Otway Fern Forest before returning to your hotel for dinner. After breakfast we begin our tour through this famous ship wreck coast line. We tour to Point Campbell National Park where we stop to explore this iconic national highlight. The area is one of the great highlights of the Great Ocean Road and is known as the shipwreck coast as over 100 ships smashed against the rocks here. The 12 Apostles have a quality that makes them irresistible to armature and professional photography. One of the most famous is the Loch Ard Gorge, a narrow Gorge located down steep steps that is named after the famous Clipper Loch Ard which dashed against the rocks in 1878. Of the 54 passengers onboard, only 2 crew members survived. We return to our hotel for dinner. After breakfast we depart to begin a leisurely drive along the famous Great Ocean Road via the holiday towns which are dotted along the coast line. We travel to the Great Ocean Road Chocolaterie and Ice Creamery in Bellbrae, where we can sample some of the delious handmade chocolates and ice cream. Watch the art of chocolate making – from hand crafting to hand packing. Check out the spectacular show room filled with thousands of chocolates to tempt you. We continue to Wye River, Lorne. During the journey we make stops to enjoy the views and lunch before travelling to Deans Marsh to Colac and return back to Skene s Creek Lodge for dinner. Adelaide travellers: After breakfast, its all aboard for our tour back to Adelaide. We travel North to Skipton and then onto the delightful old gold minning township of Beaufort. We continue to Ararat and Horshman onto Adelaide. We arrive in Adelaide late afternoon. Other travellers: After breakfast, board a V/Line service to Melbourne and be transferred to the airport for your flight home. Flights are included from all departure cities shown as required. These are based on Virgin Australia ‘Q’ Class Economy airfares, and are subject to availability at the time of your booking confirmation. Within 30 days of departure – 100% of total booking value. We recommend purchasing travel insurance for your holiday. Copyright © 2019 Senior Traveller Getaways, ATAS Accreditation A11725.